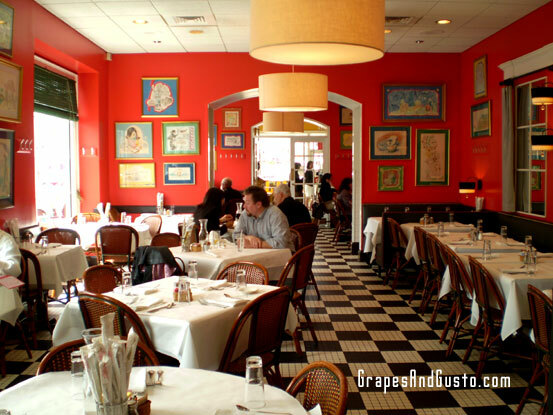 Centro offers a fun, colorful atmosphere that can be dressed up or down. By now, friends and family know the drill: whenever I go back to Fairfield for a hometown visit, everyone knows there will be at least one (or two) lunch dates set up at Centro. “So, uh, you wanna go to Centro?” I ask, as if suggesting a brand-new idea. “Sure,” is the knowing response, as my friends stifle a smirk. Centro again. This has been going on for nearly ten years. Yet I simply love this place and cannot seem to tire of it. While I usually go for lunch, Centro is a great spot for a romantic dinner date, too. My absolute favorite dish here is the Penne All Vodka with chicken ($10.95), which involves penne pasta cooked to a perfect al dente (they just know not to over-mush it), topped with a flavorful mix of crispy pancetta, savory onions and rich, rich tomato vodka cream sauce (you can choose shrimp instead of chicken, by the way). I love pairing this with a refreshing glass of Pinot Grigio – the laid-back white wine that acts like a pleasant backdrop, akin to a favorite pair of jeans—nice jeans—that smoothly pairs with a whole host of trendy blouses. I swear my other restaurant reviews will not be quite so emotional or nostalgic. If you’re in Fairfield, Connecticut, you have got to try this place out. And tell them I said hi. Who/What/Where: Centro has two sites (Darien and Greenwich, CT), but I am only obsessed with their Fairfield location. Food: Contemporary Northern Italian cuisine such as soups and antipasti, fresh pastas, as well as thin-crust pizzas, salads and sandwiches. Lunchtime features a design-your-own-omelette offering, while dinnertime adds Piatti del Giorno entrees. Catering, Take-Out and Kids’ Menus available. Wine: Believe it or not, since this is more of a sentimental restaurant review, I am not armed with their wine list at the moment (nor is it available on their site, though the menu is). However, they do pay attention to their wines and have a nice selection even by the glass. I enjoy their Pinot Grigio with their fresh pastas. Ambience and style: Light, airy, colorful and happy, yet with a sophisticated chic that keeps the both the social set and business bunch lunching here. When night falls, the two adjacent rooms create an energy of possibilities for the evening ahead. Great date spot, with a relaxed enough vibe that it won’t make you look like you’re trying too hard. In the warmer weather, enjoy dining al fresco on the patio. Amid a colorful canopy of umbrellas and fruit-printed tablecloths, you can people watch and gaze at the gazebo on the Green. Special perks: Munch on long, crispy grissini breadsticks and flavorful marinated olives while deciding on your order. Or draw a picture on the white paper tablecloths using the crayons on the tables. 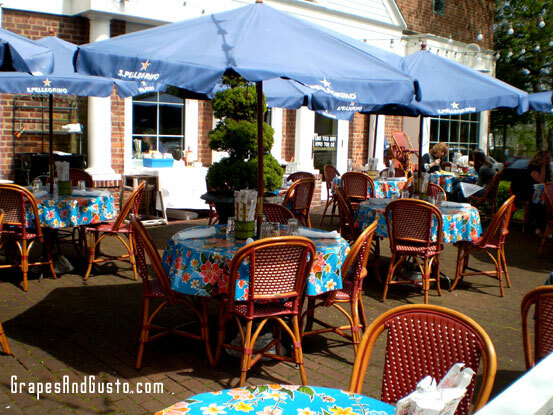 Dine al fresco on Centro’s patio, overlooking the quaint Fairfield Center. I love Centro!! It’s the best. I also like how the bar is in the back so you’re still in the middle of it all even if you just want to perch with that pinot grigio! I know – isn’t it refreshing (no pun intended) to have the bar at an unpredictable location? It changes the entire flow of the place and makes for some fun surprises at either end of the restaurant. Viva Centro!